Distribution Manifold - August Industries Inc. Manifold 2200 is set up using our MFD-2000 manifold with two outlet valves and an inlet pressure gauge 0-7500 PSI mounted. 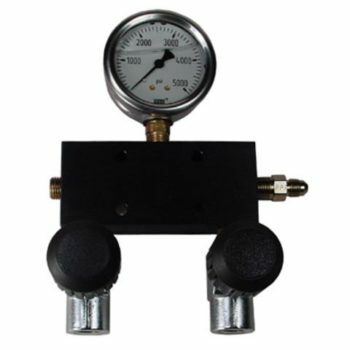 This arrangement allows the user to wall mount the distribution manifold and allows a convenient location for two fill hoses. This assembly also comes with one plug and one JIC male inlet connection. There are many other uses with this manifold and thus the inlet connection and plug will be shipped loose. Fill lines are sold separately.